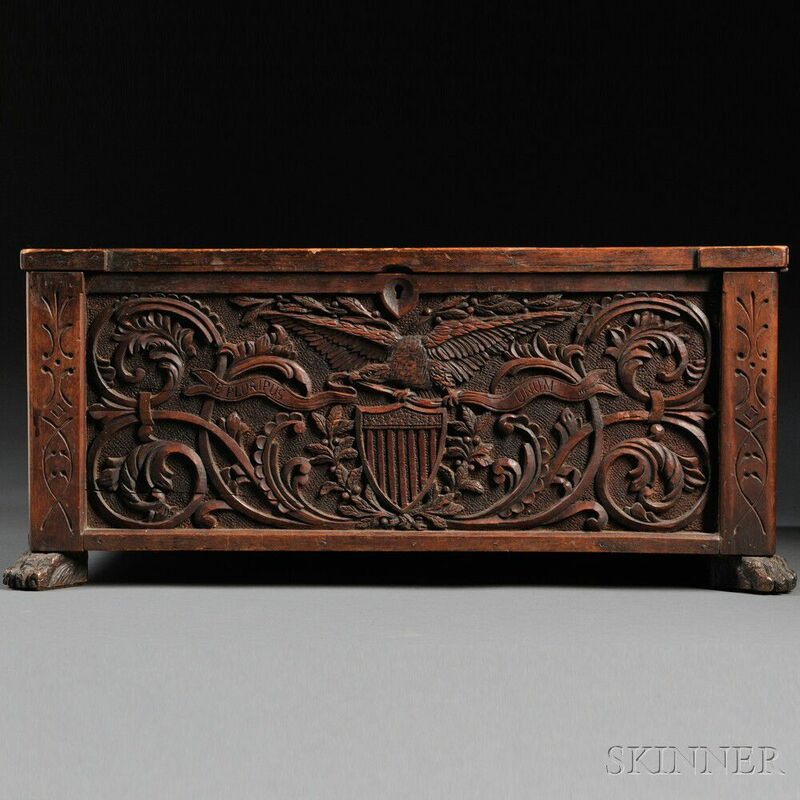 John Bellamy American Centennial Carved Walnut and Pine Box, signed and dated "J.H. 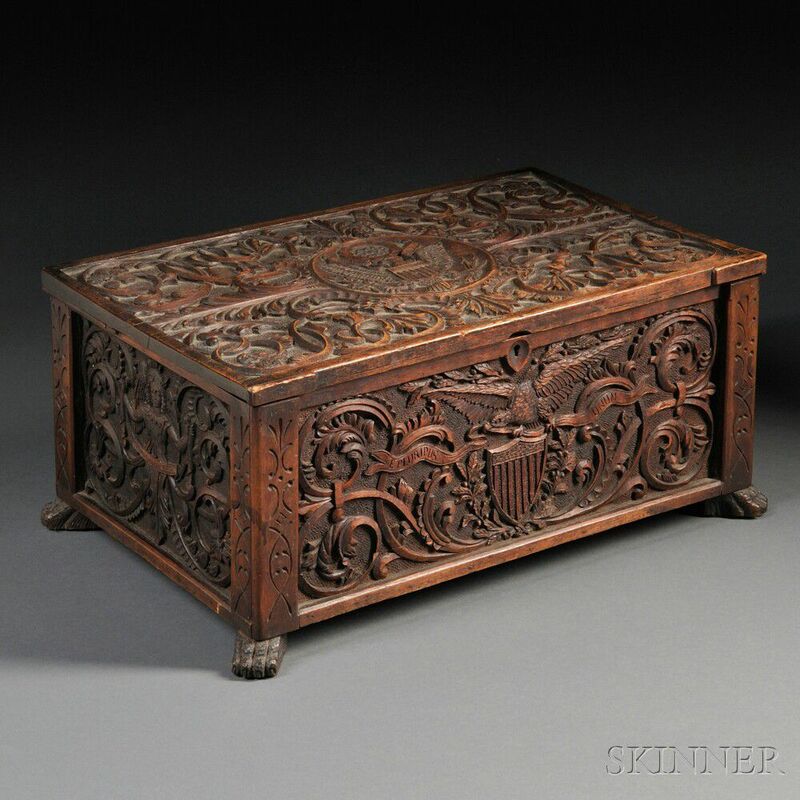 BELLAMY MAKER 1876" on the bottom, for John Haley Bellamy (American, 1836-1914), rectangular box with hinged lid supported on applied carved paw feet, the top and sides ornamented with a central relief-carved symbol of American iconography surrounded by arabesque scrolled foliage and flowers, the top centered with the Great Seal of the United States, the front carved with a spreadwing eagle grasping a banner inscribed "E PLURIBUS UNUM" over an American shield, the shields heightened with red coloration, the right and left sides with allegorical angelic figures, and the back with a simplified stylized American shield, (imperfections), ht. 8 1/2, wd. 19, dp. 12 in. 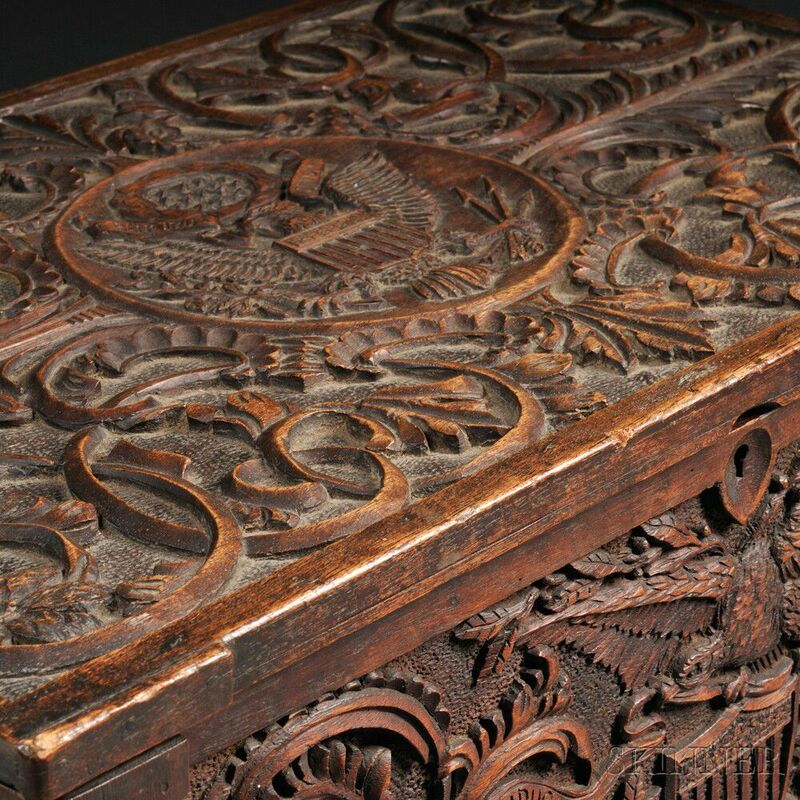 Note: Known by Americana enthusiasts everywhere as the "carver of eagles," John Haley Bellamy made his living in second half of the nineteenth century selling carvings of the American symbol to adorn ships and walls across New England. 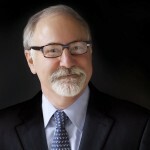 His body of work is composed almost completely of the iconic "eagle with banner" that appears with some frequency in well-known institutional and private collections. 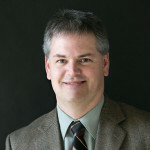 While this box is certainly a departure from his most-well-known productions, it is nonetheless an example of Bellamy at his best. 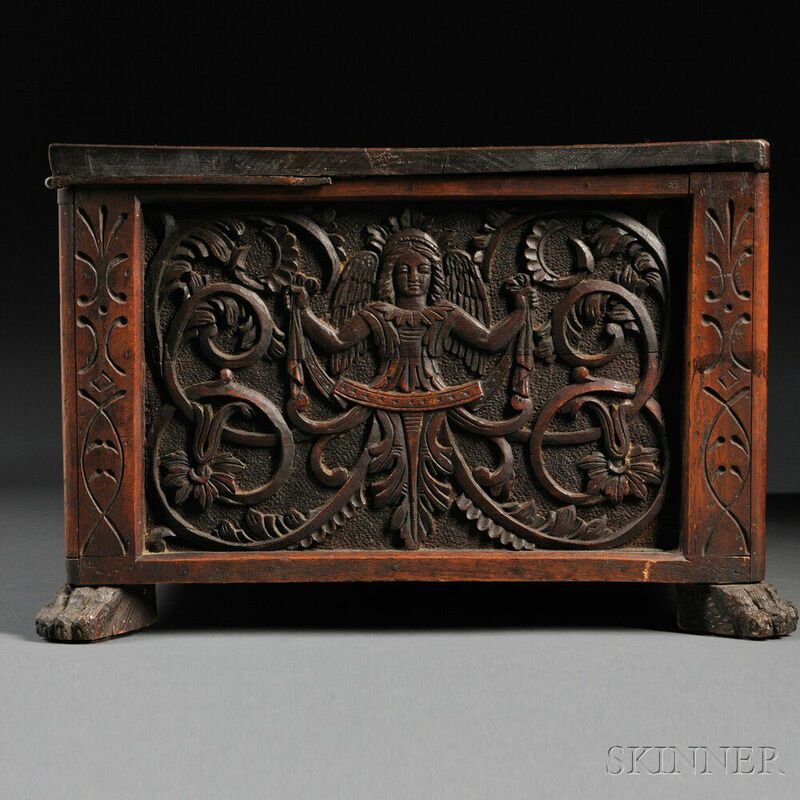 In the five visible panels of this box, Bellamy shows off his extensive skill as a carver and designer. 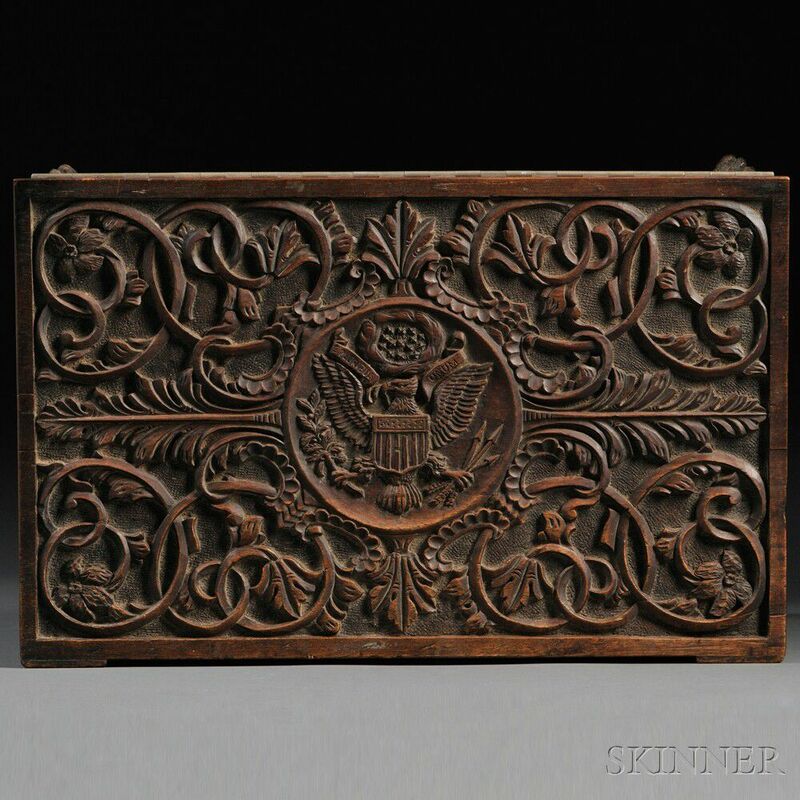 Probably intended for personal use or that of a client, it bears extensive stylistic and technical similarities to another box known to have been carved by Bellamy for his own purposes, a box heavily carved in a similar manner but with his family's coat-of-arms rather than with American patriotic motifs. 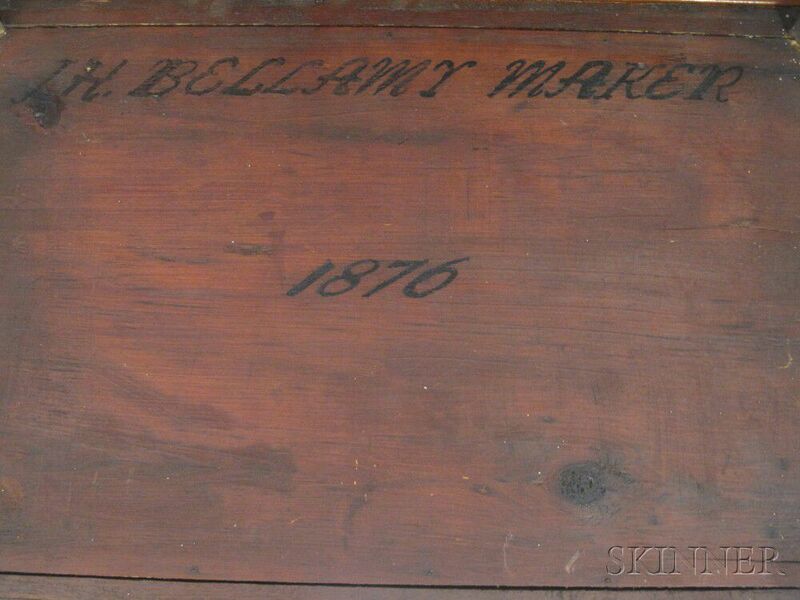 In addition, this box bears Bellamy's signature on its bottom panel, lettered before the word "MAKER." Carefully examined by James A. Craig, curator and author specializing in 19th century American marine art, the box has been found to be so certainly by Bellamy's hand that it is slated for inclusion in Craig's upcoming book on Bellamy's work. 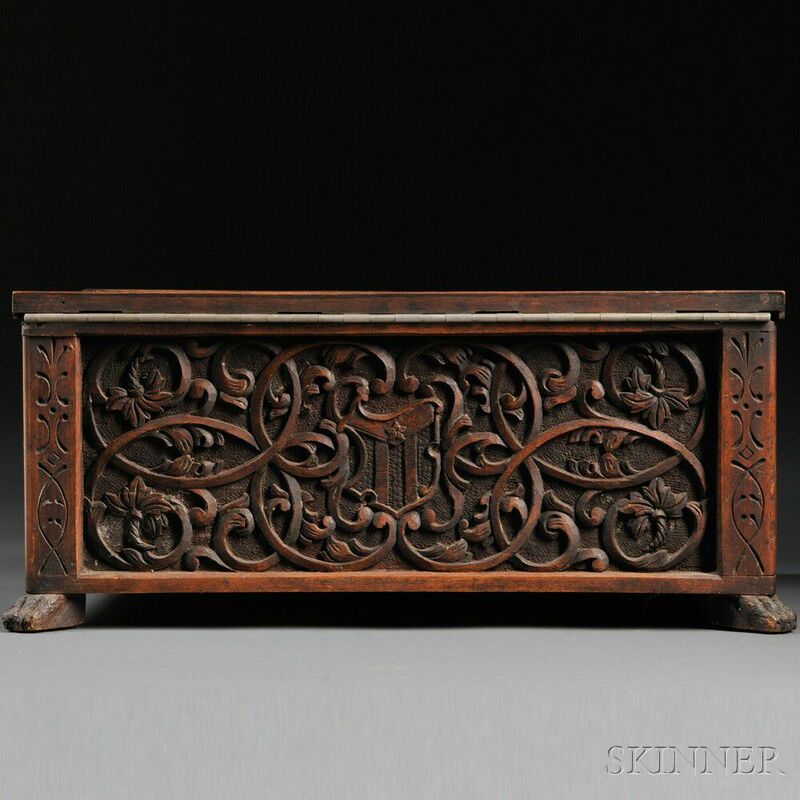 Craig connects several elements on the box to other known examples of Bellamy's carving. 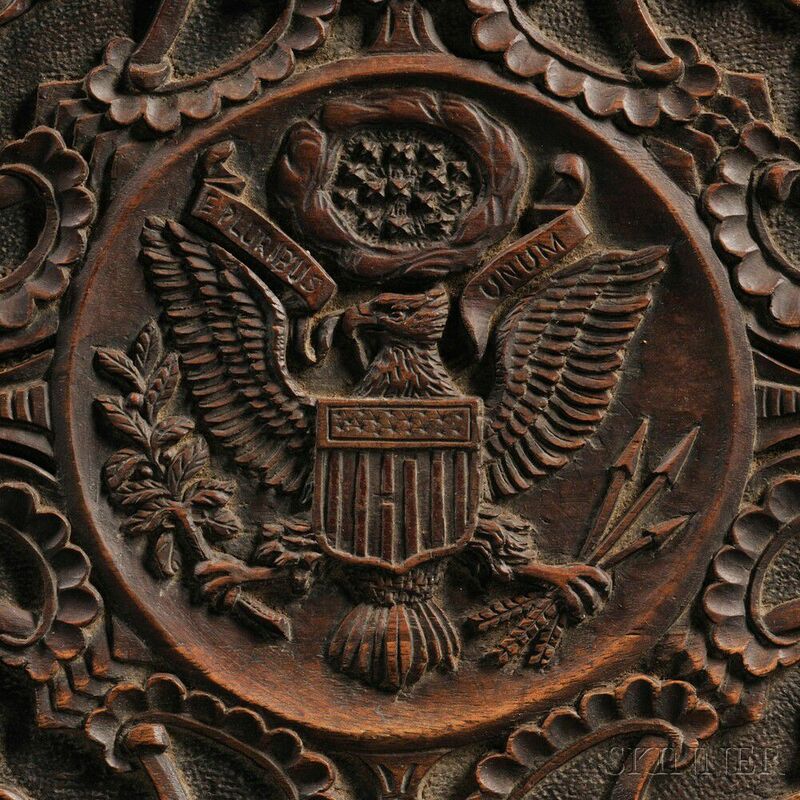 For example, the stylized florid shield on the back panel of the box relates quite directly to the same shape on the gangway board Bellamy carved for the screw-sloop-of-war U.S.S. Enterprise. 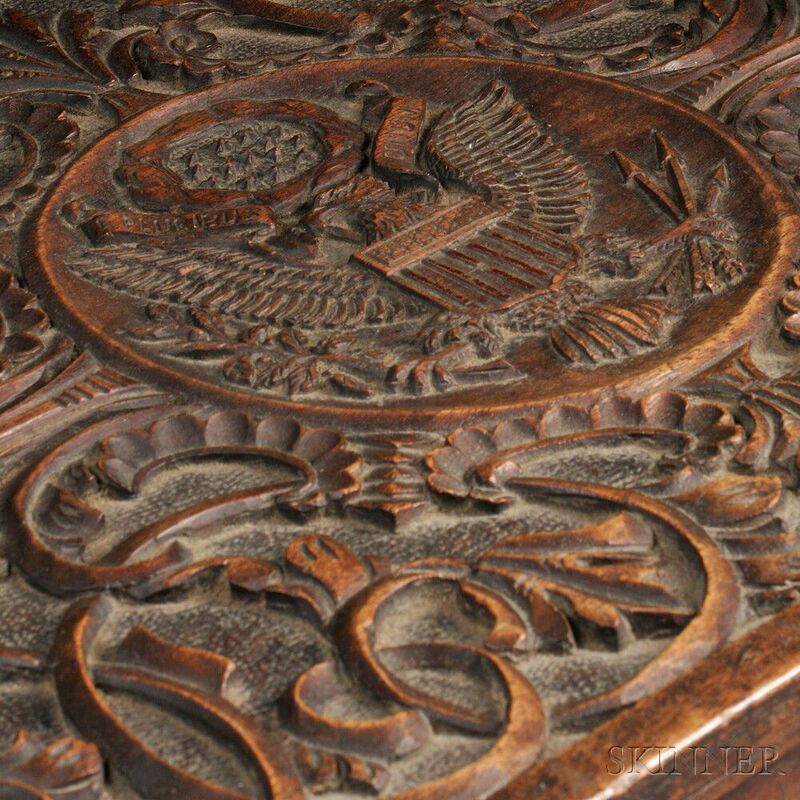 On the top of the box, the great seal of the United States appears, rigourously carved in careful detail. An eagle on the front panel of the box spreads its wings and ducks its head in a pose very similar to Bellamy's most common output, clasping a banner in its talons that bears the motto "E. Pluribus Unum." 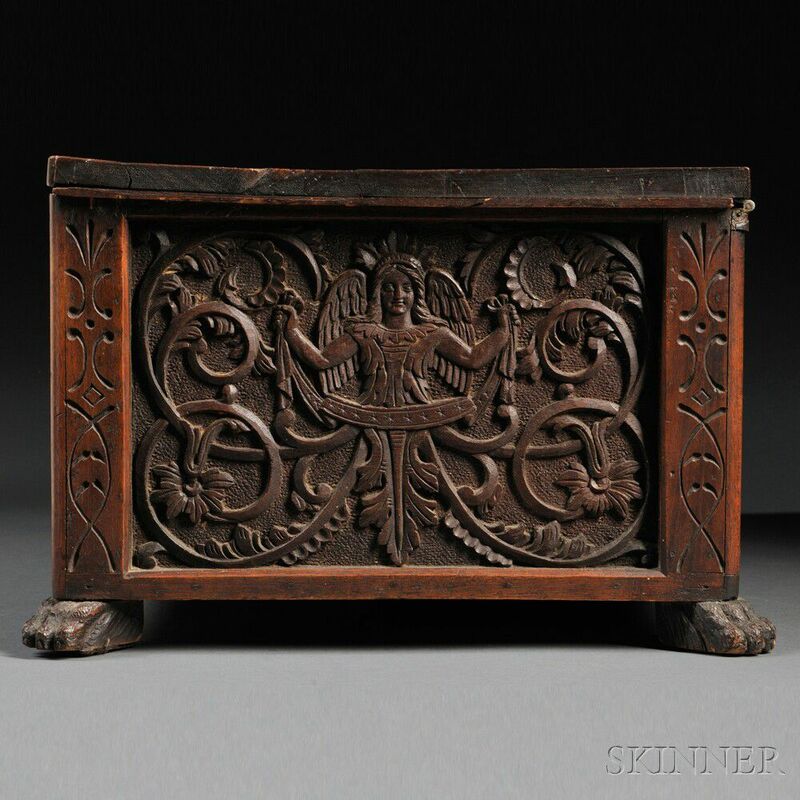 Surrounding each of these elements, though, are fields of carving having a greater sense of flourish than the artist indulged in his more market-oriented carvings for ships and public buildings. Working at a moment in time when designers enthusiastically revived motifs from the history of decorative arts, Bellamy here employs foliate c-scrolls from the mid-eighteenth century, hairy paw feet from the early nineteenth century, and patriotic motifs that belonged very much to his own 1870s zeitgeist. In this combination, he demonstrates his awareness of contemporary trends, trends to which he most certainly would have been exposed in everyday domestic and public life, through visual and material culture. 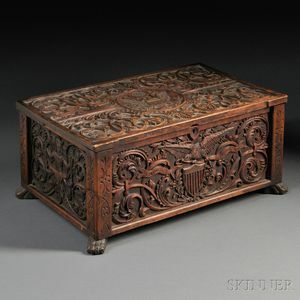 The resulting box is a pleasingly eclectic and highly successful object of late 19th century design. Some old abrasions on corners and edges, fairly minor stable shrinkage cracks on lid, front, and left side, glue repair along hinge area on cover, hinge probably replaced, a piece of the interior molding missing, small replaced segment on lid edge.